Help your students maximize learning time by using Mac to boost their productivity. This book shows educators how to use Mac and multiple apps in connected workflows to help students streamline learning processes, organize assignments, and save time so they can be engaged in more meaningful learning tasks. 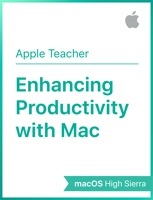 No matter what grade level or content area you teach, you’ll find versatile learning activities throughout the book that use Mac to enhance student productivity habits.